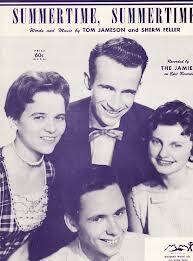 The sheet music for the Jamies’ hit. As the Jamies sang 5o years ago or so, it’s time to live and have some thrills and you can do it by checking out some of the music and arts in our fair Twin Cities. Here is but a small portion of the music that’s available. Bates, Santiago, & Santiago @ Jazz Central, Minneapolis. 8:30pm. (Donation) Young pianist Javier Santiago is back in town and wasting no time getting into the scene. Tonight he’s joining his dad Mac, on drums, and Chris Bates on bass for a couple of hours of swinging improvisation. Sue Oatts & Tanner Taylor @ Jazz Central, Minneapolis. 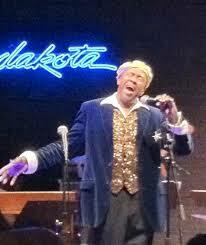 8:30pm (Donation) Thursday nights are vocal nights at Jazz Central. Sue Oatts is a fine vocalist who took a hiatus from singing when she was still Sue Tucker. Lucky for us she’s back and sounding in good form. Tanner Taylor, as always, accompanies with great sensitivity. Dave Hagedorn and Dan Cavanaugh @ The Artists’ Quarter, Saint Paul. 9pm ($5) Student and Teacher, together again. Hagedorn plays vibes in a number of bands, notably the Phil Hey Quartet and Pete Whitman’s X-Tet, and teaches at St. Olaf. Pianist/composer Dan Cavanaugh was a student of Dave’s and has garnered many awards for his compositions. The two can be light and delicate, but they can swing when the situation, or the song, calls for it. Helgeson, Vagle, & Byers @ The 318 Cafe, Excelsior. 8pm ($10) Guitarist Glen Helgeson with vocalist, Carin Vagle and cellist, Greg Byers descend on this cozy cafe in the western suburbs. Sounds like a chamber/jazz happening. Maurice Jacox Quartet @ The Artists’ Quarter, Saint Paul. 9pm ($10) Like many other music fans in the Twin Cities, I’ve often sung the praises of Maurice Jacox, whether he’s tackling Nat King Cole, jazz standards, Gamble & Huff compositions, or singing full bore blues and R&B. Tonight he’ll be accompanied by Thomas West, piano; Bruce “Pooch” Heine, bass; and Kenny Horst on drums. Should be a delight. Wine & Jazz Fest @ Saint Croix Vineyards, Stillwater. 11am – 6pm (Free) Well, you may part with some money after you sample a few wines, but basically, this is a chance to visit a vineyard and celebrate award-winning musicians and wine. The lineup includes Mike Salovich & Marc Anderson (World Music); Patty Peterson featuring the Tanner Taylor Group; Seven Steps to Havana (Latin Jazz), and headliners, The Atlantis Quartet. The Tuesday Night Band @ The Artists’ Quarter, Saint Paul. 9pm ($10) Well, Saturday Night is party night, and the Tuesday Night Band is a party band, albeit with jazz sensibilities. Billy Franze, guitar; Downtown Bill Brown, organ; and Kenny Horst, drums, can lay down the funk of the Meters, and turn around and tear through a Wayne Shorter tune. Here’s a video of the band in action. Wozniak, Peterson, & Horst @ The Artists’ Quarter, Saint Paul. 9pm ($5 – Ladies free!) Brandon Wozniak is really coming into his own as an imaginative improviser on the saxophone. Tonight he’s joined by Billy Peterson on bass, and Kenny Horst on drums to create a high powered sax trio. Chastity Brown Band @ Victory Memorial Drive, 3401 Xerxes Ave So, Minneapolis. 6pm (Free) Part of the Live on the Drive Series, Chastity Brown is a singer/songwriter who channels the blues, gospel, and folk music into her art. Bethany Larson & the Bees Knees @ Minnehaha Bandshell, Minneapolis. (Free) Hmm, a pretty parkland setting, with lots of trees. Opportunities to picnic, or to get some fresh seafood from Sea Salt, an active and overflowing waterfall, and a country/folk rock band. Sounds like a wonderful Friday evening. 3rd Annual Roots, Rock, & Deep Blues Festival @ Harriet Brewing, Mosaic Cafe and Patrick’s Cabaret, Minneapolis. 1pm – 10pm ($15/Advance/$20 Gate) Limited to 2,000 tickets. Spider John, Crankshaft & Gear Grinders, Jeff Ray & Stakes, Kent Burnside & the New Generation, Black Audience, Chastity Brown, and bands from California, NJ, MA, IL, AL, AR. Nick Mrozinski, aka Nick the Feelin’ or Nicholas David (on The Voice) may be there as well. Grandmothers of Invention @ The Dakota, Minneapolis. 8pm ($25) Okay, so their PR photo shows these guys in tuxedos, guys who went out of their way to look disreputable back in the day. Nevertheless, they play the avant-garde rock of Frank Zappa, and because they were all members of the Mothers of Invention, they not only know how to play it, but they can play it well, and with understanding. Here they are about a year ago. 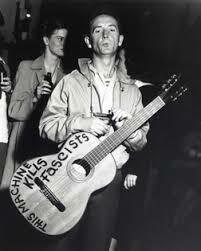 Woody Guthrie 101 @ The Eagles Club #34, Minneapolis. 6:30pm ($15 advance, $20 Door) Pop Wagner, Tony Glover, and Charlie Maguire perform their Fifth Annual Woody Guthrie Tribute, featuring stories, songs, and more. Everett Smithson Band @ Roseville Central Park, Roseville. 7pm (Free) Party music, South Louisiana style, with Cajun, Zydeco, New Orleans R&B, hillbilly, rockin’ roots, and more. Besides Smithson on harp and Kathy on accordion, the band has Jeremy Johnson on drums, Phil Schmid on guitar, and Bill Black on bass. You couldn’t ask for a better rhythm section. Zydeco dance lessons are part of the evening. Cactus Blossoms @ The Landmark Center, Saint Paul. Noon – 1pm (Free) Imagine the Everly Brothers singing the early songs of George Jones and you’ll begin to understand the possibilities behind this group. Grab a lunch, sit (or dance) and enjoy yourself. This entry was posted on Wednesday, July 10th, 2013 at 7:46 pm and is filed under Weekly Preview. You can follow any responses to this entry through the RSS 2.0 feed. You can leave a response, or trackback from your own site.